Obligatory disclaimer: I was asked to do this review by Persona Pizzeria. Thus, all food and beverage described in this post were free. 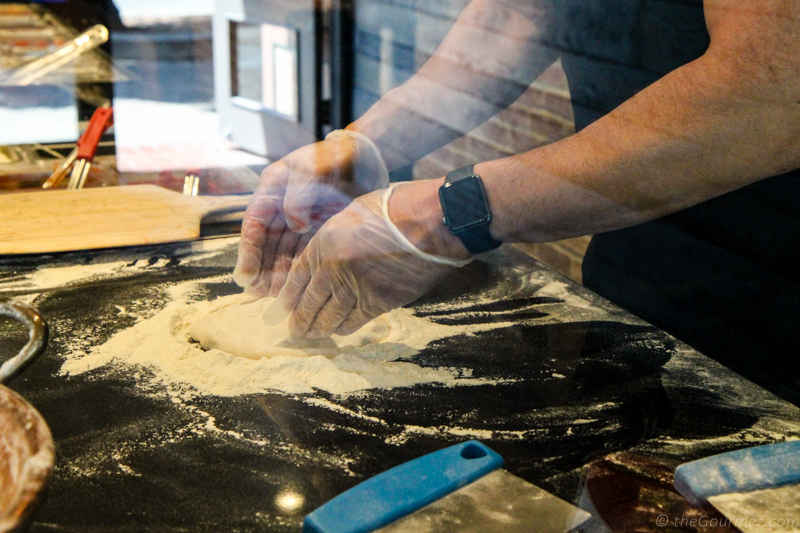 Persona Pizzeria is a fast-expanding small chain with a fantastic reason for it: they make customizable Neapolitan-style pizza to order with quality ingredients from flour to toppings …. and they are ready in 90 seconds! Co-founder and chef Glenn Cybulski, a world champion of wood-fired pizza making, is responsible for the award-winning specialty pizzas Persona offers, and the reason those pizzas come out so fast is a brick oven set to 800 degrees. 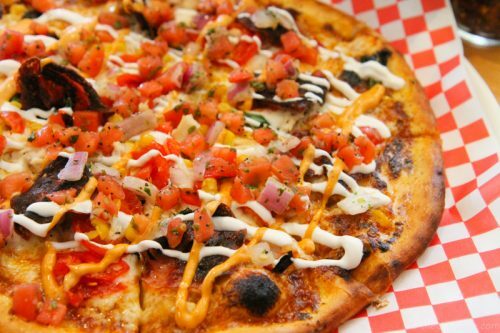 Think about it: pizza that is genuinely fast food without being by the slice. REVOLUTIONARY. I tried out the Santa Rosa location on a recent weekend trip to the Russian River, and first things first, I love that these guys have figured out how to cash in on the Pokémon Go craze. Knowing how to harness the power of cellphone trends shows smart marketing acumen. 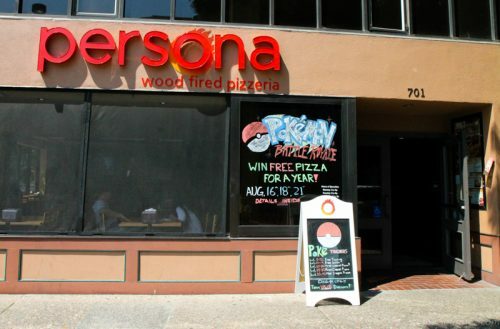 But Persona Pizzeria doesn’t really need it, because the concept is great from the get-go. Nick Ulrich, who owns the franchised location with his two brothers, guided me through the process. 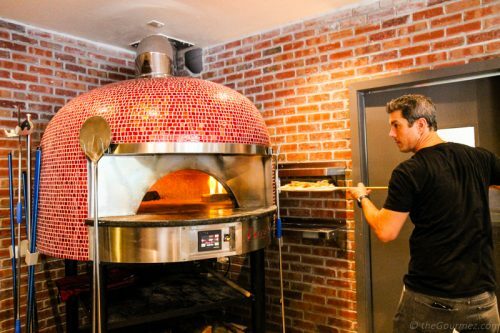 Nick has been with Persona Pizzeria in some capacity or other since early on, having been friends with Glenn since they were kids. 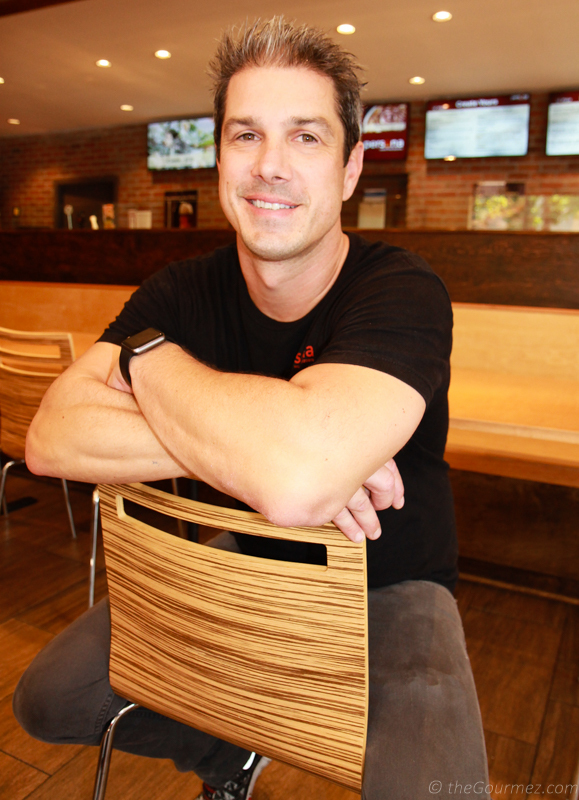 When opening a downtown Santa Rosa location became a possibility, Nick couldn’t resist trying his hand at the day-to-day operation of the restaurant with his family. On this particular day, that hand prepared my pizza from scratch. Check out the menu as you enter, then decide whether you’re making your own pizza or going for one of the suggested combinations. Or do both, like I essentially did. 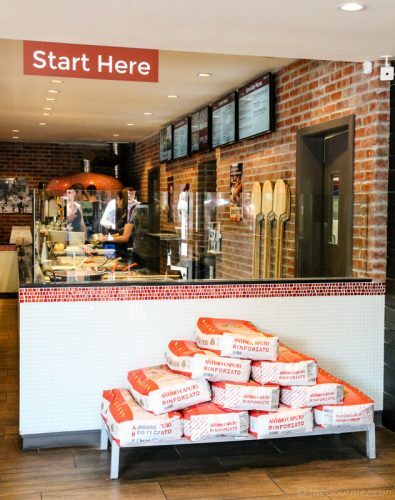 Whatever you decide, begin your order at the Start Here sign right above sacks of imported Caputo 00 flour from Naples. 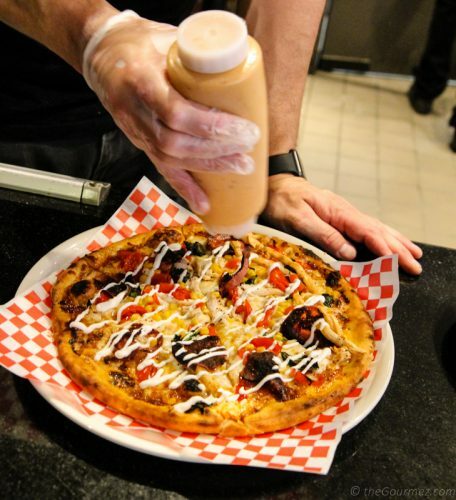 I could not resist trying the Chipotle Chicken pizza, which earned Glenn that World Pizza Champion designation. But I also couldn’t say no to adding a few extra ingredients, because that’s how I roll. So Nick layered on salami, corn, basil, and peppadew peppers in addition to the chicken, chipotle dressing, and mozzarella. Then he fed it to the flame. Were I a regular customer, each of those additions would cost $1.25, and the veggies are locally sourced when possible. At the Santa Rosa location, the basil comes from a school garden at St. Eugene’s Cathedral School. Unsurprisingly, the pesto was quite a hit on the school’s fundraiser night at the restaurant! 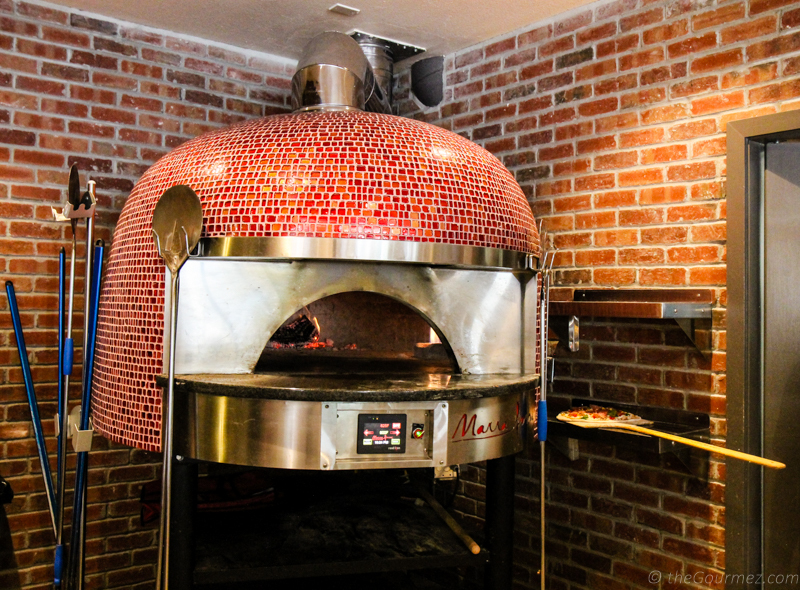 A build-your-own pizza — which includes cheese, garlic, olive oil, and either marinara, margherita, pesto, or blanco sauces — starts at $7.95. Specialty pizzas range from $11 to $13. The pizza’s size easily feeds two people. Nick shared with me that the craziest toppings pile he’s seen came from a man who wanted to add every topping he could to his pie! That made the cost well over $40, but the customer thought it was worth it just for the thrill. In less than two minutes, my pizza was taken out and finished off with crema, more chipotle sauce, and pico de gallo. I retreated to my seat and dug in. The bubbled to charred crust ratio was perfect, and I was impressed with how well the crisp crust held up under a load of that many toppings. The chipotle sauce tasted great, with enough spice to satisfy without dominating the other flavors. The corn disappeared without a discernible trace, but the peppadew peppers added good sweetness and a little extra fire. I could have done without the crema, as the chipotle and marinara offer enough moisture between them, but overall, it was a great pizza. 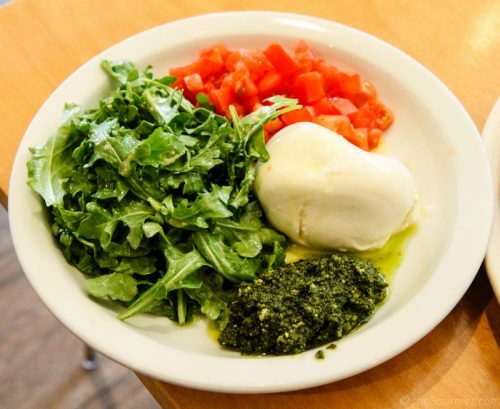 Since one cannot — okay, should not — live on pizza alone, we also tried the burrata salad, one of the few non-pizza items on the menu. Its simple arrangement was rather visually pleasing. The burrata was as creamy as it should be, and that pesto is a delightful herbal bevy – good job on the basil-growing, St. Eugene kids! Other than those small critiques, I don’t have a negative thing to say about my Persona Pizzeria lunch, and I’d be surprised if you do. Give this unique concept a try; you’re going to sooner or later, because it’s going to explode all over the place. When done well, expansion can be a very good thing for all of us.